Most of us have a have a hard time sleeping from time to time. Whether you’re an early riser or you love sleeping in, getting out of bed after a bad night sleep is no pajama party. A restless night’s sleep, or staying up too late can lead to a barrage of negative effects beyond crankiness. It does our anti-aging efforts no good. Getting a good nights sleep does wonder for your skin. It will take away the sallow complexion and dark eye circles that a lack of sleep accentuates. Then there is the problem of forgetfulness. Who can remember anything when your body screams for a restful night of sleep. That brain fog just stays with you on and on. You are more likely to have accidents and serious health problems with a continual lack of sleep. There are even more risks associated with not being able to sleep. Your body becomes a target for heart disease, high blood pressure, strokes, and diabetes to name a few. But those are bad enough! If you have insomnia, there is a better than good chance that you have other health-related problems. Solve one problem at a time and perhaps the others will resolve. So, what can you do to make sure you get the quality shut-eye you really need? It turns out the foods you eat in the evening may have a greater impact than you realize on your sleep quality and your ability to fall asleep. Here are some of the food and drinks to turn to when sleeping soundly is a must. Cherries contain naturally occurring melatonin, a compound produced in the pineal gland, which helps to initiate the body’s natural sleep cycle. 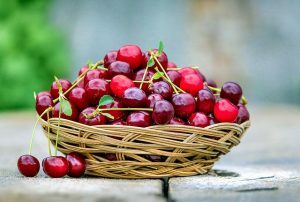 Eating fresh cherries or drinking tart cherry juice may help you to relax enough to go to sleep and stay there. Inadequate sleep is associated with weight gain, high blood pressure, puffy eyes, as well as just feeling tired and not really yourself. Dare we use the word grumpy? Bananas contain both magnesium and potassium, both of which help to naturally relax the body. As an added bonus, the potassium in bananas may improve heart health and mental functioning. Fatty fish like trout, mackerel, salmon, and tuna have plenty of vitamin D and omega-3 fatty acids which could help improve the quality of sleep. In addition to helping out with sleep, vitamin D can guard against heart disease and promote healthy brain function that accentuates our anti-aging lifestyle. Almonds are high in magnesium which may help you fall asleep. Additionally, they contain melatonin, a sleep promoter. Almonds can also decrease cortisol, a stress hormone, which could help you unwind before you hit the hay. 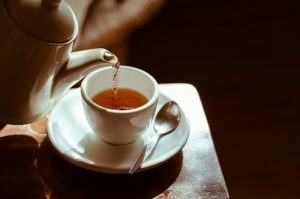 There are many kinds of caffeine-free herbal tea that have sleep improving properties. Chamomile tea is known for its inflammation-fighting antioxidants which promote restful sleep. It can also help with depression which is often linked to sleep problems. Passionflower tea also contains sleep encouraging antioxidants. Additionally, it increases gamma aminobutyric acid or GABA in the brain. This substance encourages calm and relaxation while at the same time lowering our stress levels. No wonder it helps us to sleep. A warm glass of milk leading to peaceful slumber may have some merit to it. Milk contains tryptophan, an amino acid that may gently encourage the snoozes. Wonder why you are so sleepy after Thanksgiving? Perhaps it is because of the volume of delicious foods we eat. 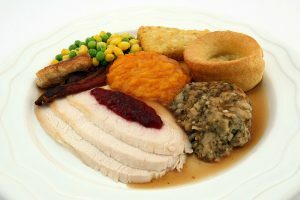 But maybe it is in part thanks to the tryptophan in turkey. That substance increases the substance serotonin, which increases melatonin, which helps you to go to sleep and to stay asleep. It’s best to consume any food or drink 2-3 hours before bed. Eating right before going to sleep can lead to digestive issues which could end up keeping you awake, even if you’re choosing your foods carefully. Everybody is different, so finding what works for you may take some trial and error, but the reward is well worth the effort. 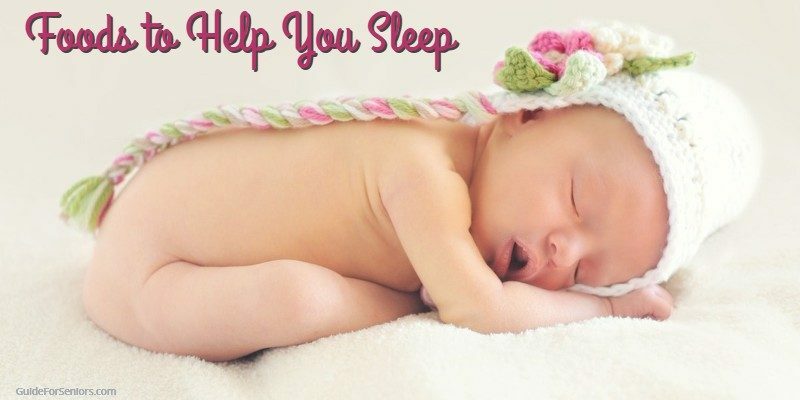 A good night’s sleep can make a big difference in both your physical and mental well being. It will help to show our anti-aging efforts. and that is good for everyone. 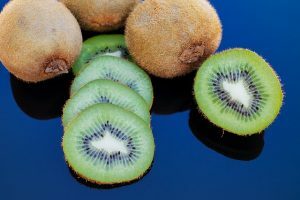 Read more about foods that are good for you at GuideForSeniors.com.